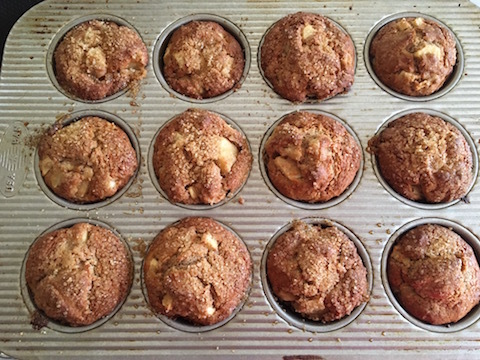 Right before Passover, I spotted this muffin recipe on the King Arthur Flour website. 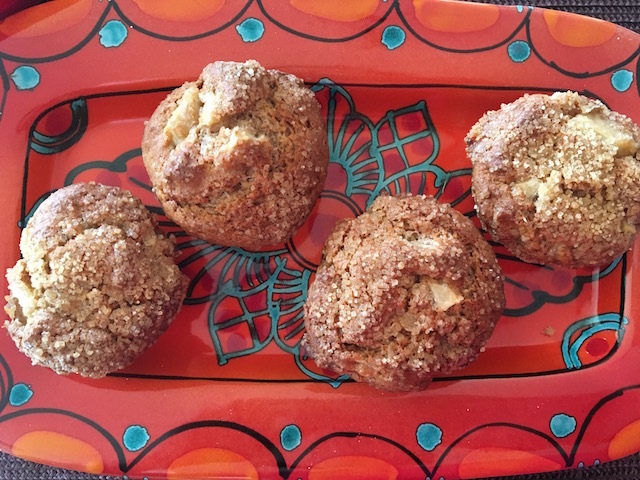 Since I love King Arthur flours, particularly the white whole wheat variety, I decided to try these breakfast apple muffins. I cut the sugar way, way back and still find these pleasantly sweet for me and for the rest of my extended family too. I added some grated lemon zest because, in my humble opinion (or IMHO as the kids say), lemon makes everything taste better. And I added crunchy turbinado sugar, just a bit, for the topping in lieu of more brown sugar for texture. Preheat the oven to 450°F. Spray 12 muffin cups and set aside. Mix together the flours, baking powder, baking soda, salt, zest and cinnamon, and set aside. In a separate bowl, cream the butter and add the granulated sugar and the dark brown sugar. Beat until fluffy. Add the egg and mix well; stop once to scrape the sides and bottom of the bowl. Mix in the kefir gently. Stir in the dry ingredients and fold in the apple chunks. Divide the batter evenly among the prepared muffin cups, they will reach the top of the cup or be slightly over. Even out the thick batter with a knife that you spray with oil and sprinkle the three tablespoons of turbinado sugar on top. Bake for ten minutes mid oven, turn the heat down to 400°F and bake for an additional five minutes, or until a toothpick inserted into the center of a muffin comes out clean. Cool the muffins for five minutes in the tin, then turn them out onto a wire rack to cool completely. Transfer to a tightly covered container. These stay fresh for at least five days at room temperature, if you can stop yourself from indulging. I love these slightly warmed with whipped cream cheese. This entry was posted in Breads, Breakfast and tagged Apple Muffins. Bookmark the permalink.